As I remember, I enjoyed the heck out of this when it came out. Enough so that I still have a copy all these years later. Hot damn! I’d never heard of this. How have I never heard of this? 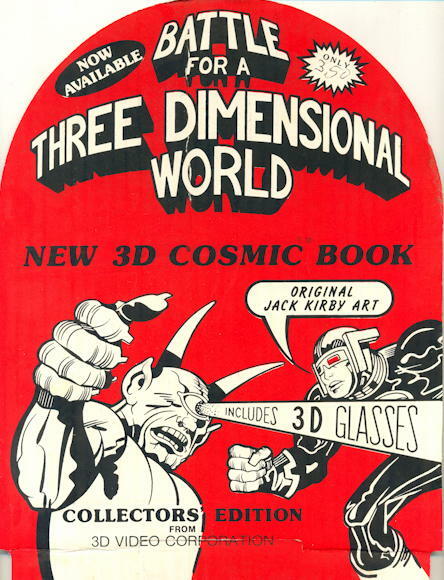 When I was thinking about doing a book collecting 3-D comics stories a while back, this is the one that I really wanted – it’s the whole 3-D concept being explained via original Jack Kirby superheroes. I used to see that comic around a lot, too. I bought five or six copies over the years, whenever I saw it for less than fifty cents, and gave away all but one. The most disappointing thing was that no copy I bought ever came with the “King of Comics” glasses, always with either generic 3-D glasses or none at all.